Enjoy entrance to Oslo's Kon-Tiki Museum, dedicated to the sea expeditions of Norwegian explorer Thor Heyerdahl. 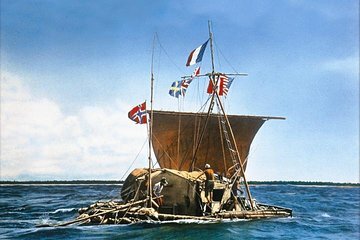 The museum is home to Heyerdahl's balsa wood Kon-Tiki raft, which he used to sail from Peru to Polynesia in 1947, as well as numerous other exhibits. See artifacts relating to Heyerdahl's visits to Easter Island, marvel at the stunning craftsmanship of the RA—the first ship to sail under a United Nations flag—and learn about one of Norway's most legendary figures. Your attraction ticket includes a noon showing of the Oscar-winning Kon-Tiki documentary film. Great fun, great for kids. The self tour is quite interesting. The ship itself is amazing and would interest adults and children. Many artifacts are included in exhibits and are well signed. You can catch a short orientation movie and watch the original 1 hour movie.